At the time I started writing this post we were living in a Chatter Mobile world, this is no longer the case. As announced recently at Dreamforce ’13 we have entered the Salesforce1 era, the direction of which will no doubt become clearer as we transition to the Spring ’14 release. What is clear now however is that the unified platform is the focus this time, providing mobile enablement (apps) via a rich set of platform services (APIs x 10). A rich set of robust APIs is always great news for any development community, whether you’re connecting a mobile device or sensor device (IoT). I won’t venture further into what Salesforce1 is in concept or the implications, some of this is yet to be seen. In any case this blog is focused on the practical application of the Salesforce and Force.com technologies, and as such the following summary is a point-in-time outline of the information available at the time of writing. So, on to the topic in hand, customisation options for the Salesforce1 mobile application. As with most things in life, to make good design decisions it helps to understand the full set of options available (and to see the big picture). This obvious point is fundamental in architecting Salesforce platform solutions; it’s key to have knowledge of the complete standard feature set and extension points (declarative build model) such that technical solution components are minimised. Simply put, in the mobile context this guiding principle means exhaust the potential of the standard apps (meaning Salesforce1) and the customisation options before building a new custom mobile app from scratch. The following summary notes attempt to clarify the function of the Salesforce1 app and the various customisation options. The Salesforce1 App – What is it? In application development terms the Salesforce1 app provides a flexible mobile container into which a blend of standard and custom functionality can be presented on a variety of connected devices (mobile, tablet etc.). The container itself comes in 2 forms; downloadable native app (iOS and Android) and mobile browser app. In either form Salesforce1 employs a feed-first paradigm, with publisher actions and a notification platform. The mobile browser app must be enabled from the setup menu under Mobile Administration->Salesforce1 and becomes the default when accessing Salesforce from supported devices (as-per Salesforce Touch). Salesforce1 does not replace the standard Salesforce web app, or Full Site as it is referred. Salesforce1 does replace Salesforce Touch, Chatter Mobile and Salesforce mobile apps. Ok, so assuming we’re comfortable with the idea that Salesforce1 is a application container, how can we extend the functionality of the container to deliver custom application interactions? The following summary notes attempt to clarify the customisation options available with the Salesforce1 mobile app. Also included in the list are standard capabilities of the container app, provided for completeness. The Salesforce1 App Development Guide provides a comprehensive coverage of the topics including example code that can be loaded into a development org (via github) to experiment with. Within the setup menu under Mobile Administration, the Mobile Navigation option provides the ability to define the content and structure of the left hand side menu of the container app (as shown in the screenshot below). Note. The first item in the list becomes the home page. Self explanatory. Recently searched for objects appear under the Recent section in the mobile menu structure according to profile permissions. It would appear that page layouts are shared between Salesforce1 and the standard Salesforce web app. This may prove difficult in terms of providing a balanced structure that is effective in both views. I’m not 100% clear on the use cases for Flexible pages, however they do exist and can be added to Flexible page Tabs and ultimately rendered in the container app via inclusion in the menu structure (via Mobile Navigation). I need to do some further investigation into the potential of Flexible Pages, perhaps I’m missing something obvious. A Flexible Page can have global publisher actions, list views and scoped recently used items. A maximum of 25 components can be added to the page, this constraint applies to listviews and recently used items. In terms of definition a Flexible page is manually created in XML and deployed to an org via the Force.com Migration Tool or IDE. Once a Flexible page exists in an org the Create->Tabs page will present a Flexible Page Tabs list (as per Visualforce tabs etc.). Publisher actions are accessed via the (+) button on the home page, Chatter tab, Chatter group and record detail pages. Actions can be Standard or Custom and Global or Object scoped. Create a Record – respects Validation Rules etc. A Create action defined for a object will automatically relate created child records. Default standard actions are provided for the core standard objects (create and update), such actions have configurable layouts and the ability to predefine field values. Interestingly actions can be described and invoked via the REST API, resource paths below. Record highlights fields (first 4 fields in the ordered field list). The record highlights are displayed in the top region of a record detail display under the icon. Defines the fields that appear in the Chatter feed if a record us created via publisher action. Page layouts now have a section for Mobile Cards, the following items can be added which then appear as a swipe-to card within the record detail view within the Salesforce1 app only. Expanded Lookup. Related object (via Lookup) Custom Layout fields are displayed. 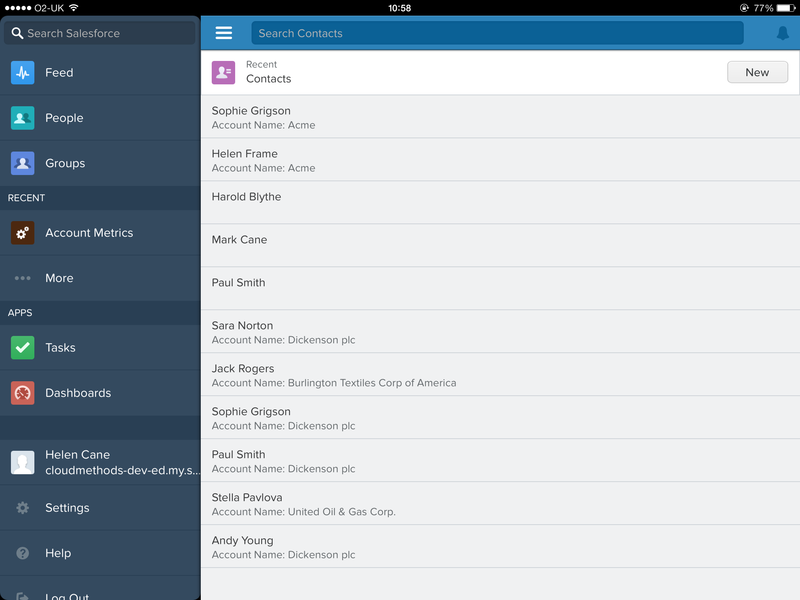 There are a number of extension points within the Salesforce1 app where Visualforce pages can be employed. In short, where branded or complex UI interactions are required Visualforce provides a good option. Such pages must be carefully designed to deliver a optimal mobile experience and where possible be adaptable to also work in the standard Salesforce web app. This latter point relates to the cost of development and maintenance, adaptability is better than duplication – at the cost of smart design. There are a number of extension points within the Salesforce1 app where Force.com Canvas apps can be employed. Pilot program currently. The use cases for the above will be varied and no doubt very interesting. Over time I think we’ll see more traction in the area of application composition. The ability to compose experiences and interactions across applications seamlessly (with context) and securely is a powerful concept. Recently searched for objects for the user. Searches performed in the full web app appear can appear In the left navigation menu, pin objects in the full site to keep at the top of this list. Push – Mobile device applications only, push notifications not supported by the mobile browser app. Such notifications will appear as badges on the app icon etc. The notifications are limited to Chatter (mentions, posts, comments etc.) and Approval requests. Notifications are enabled at the org-level, not per-user. In application development terms, Salesforce1 provides a rich set of declarative and programmatic techniques for the development of mobile interactions. Building out compelling mobile experiences that replace or augment existing Saleforce functionality (custom or standard) should be highly achievable whether you’re technically minded or not. This in my view is the real power of the Saleforce1 app, once you accept the proprietary approach there are no barriers to rapid mobile enablement. The newly released Salesforce Touch Platform Guide provides a very useful consolidation of both technical information and design guidance pertinent to mobile development on the Force.com platform. Topics covered include Identity, Connected Apps, Mobile Components for Visualforce etc. All in all an essential read for anyone considering mobile app development. Of particular interest is the content related to the Hybrid model of mobile application development (chapter 6 & 7), combining the benefits of native app development, i.e. on-device integration (Contacts, Calendar, local storage etc. ), with the rapid development and ease of update of HTML5 development and web apps.